James Penrose Harland (1891-1973), professor of archaeology, received his BA (1913), MA, and PhD from Princeton, the last after a delay caused by his service in the Navy during World War I. 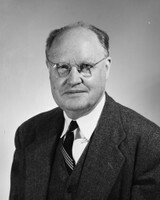 He taught at the University of Michigan and the University of Cincinnati before joining the Classics Department at UNC in 1922 as an Assistant Professor, the first full-time archaeologist at the University. Promoted to Associate Professor in 1927 and Professor of archaeology in 1929, he continued to teach large and highly popular undergraduate courses until his retirement in 1963. Harland sometimes taught a thousand students in a year, and even after his retirement he continued teaching in the Evening College until 1968. As a field archaeologist, Harland spent a total of four years between 1914 and 1927 at the American School of Classical Studies at Athena and participated in excavations at Nemea, Zygouries, Corinth, and Mycenae. His area of specialization was Bronze Age Greece, on which he published studies of the Peloponnese and Aegina. Harland was a colorful character with a lively and sometimes mischievous sense of humor, always extremely popular with his students. For a more detailed account, see here. The J. P. Harland Endowment Fund in Classical Archaeology was established in 1993 by one of his former students to provide general support for classical archaeology. In recent years we have used it for institutional memberships in research organizations such as the American School of Classical Studies at Athens and the American Schools of Oriental Research, which provide vital benefits for archaeologists in participating departments, and to co-sponsor a public lecture series with the Triangle Society of the Archaeological Institute of America. Its main use is to help graduate students participate in archaeological fieldwork, specifically to offset expenses associated with travel to Greece, Italy, Turkey, and throughout the Mediterranean world. Please consider making a gift online to the J. P. Harland Fund (101585).